WAO history was made this month when the first WAO International Scientific Conference (WISC 2010) took place in Dubai, UAE from 5 to 8 December. More than 1,438 delegates from 71 countries participated in the scientific program delivered by 55 presenters from around the world with expertise in asthma and its co-morbidities. WAO is dedicated to providing education and training opportunities to physicians worldwide and supporting their efforts to improve outcomes and quality of life for patients with asthma and allergic diseases. Many people helped to achieve this goal with WISC 2010 and should be thanked. I am grateful most of all to the delegates who participated in the program and took advantage of the special social activities Dubai had to offer. I hope all of you found it to be a satisfying experience. The Scientific Program Committee developed an outstanding program on Asthma and Co-morbid Conditions: Expanding the Practice of Allergy for Optimal Patient Care. The success of WISC 2010 is also due to the time and tireless efforts of the Local Organizing Committee, Regional Advisory Board and WAO Board of Directors. To view the WISC 2010 committee members, click here. Visit the WISC2010 website for conference updates over the next few weeks including a list of Outstanding Poster Awards, presentations, photos and more! The CME self-reporter was included in the registration bag for all conference attendees. For any questions or concerns regarding the CME self-reporter, please contact us at WISC2010registration@worldallergy.org. If you wish to provide feedback about your experience at the conference, please email us at: WISC2010@worldallergy.org. Watch for new information about the next WISC in 2012 to be held in India. December also has been a month of celebrated events and holidays. My best wishes to all of you for a healthy new year! And we'll see you next year in Cancún, México (4-8 December) for the XXII World Allergy Congress. Richard Lockey, WAO President, opening the WAO International Scientific Conference in Dubai, paid tribute to Professor Cassim Motala who passed away on November 16 while at the Congress of the Asia Pacific Association of Allergy, Asthma and Clinical Immunology Society in Singapore. "Cas was a beloved friend and colleague, and I have wonderful memories of spending time with him on tour in Northern Spain where we laughed, relaxed and became firm friends. Cas was a founding member of the Allergy Society of South Africa and earlier this year was promoted to full Professor at the University of Cape Town. As President of WAO, and on behalf of the WAO Board and staff, my deepest condolences to his dear wife, Dr. Farieda Desai, his son Mikhail and the rest of his family and friends." Prof. Lockey has asked Prof. Paul Potter to pay tribute to Cas on behalf of the WAO Board of Directors. The passing of Cas Motala is really a great loss to me and my wife Anne; he has been one of my best friends for 30 years. Our thoughts and prayers go out to his wife Farieda and to his son Mikhail. Cas and I trained together in Pediatrics at the Red Cross Children's Hospital, specializing in Allergology. Cas had worked untiringly for the Allergy Society of South Africa since its inception 22 years ago and held all the portfolios at various stages. He was always so wise in the many big decisions we had to make, and had a great passion for allergology. He is co-editor of the updated 3rd edition (2010) of the 450 page South African ALLSA Handbook of Allergy which will be going out to 5000 South African doctors. He had also just completed the new South African Paediatric Asthma guidelines, recently published, of which he is the lead author. Cas will be sorely missed as head of Pediatric Allergy at the Red Cross children's Hospital in Cape Town. He was very committed to the Red Cross Children's Hospital children's fund, and through his personal efforts he raised a lot of money for both the hospital and for the Allergy Society of South Africa through his networking with the pharmaceutical industry, and it is through his vision that the Allergy Society today owns its own premises in Waverley Centre, Mowbray. Cas served on the World Allergy Organization Board of Directors from 2001 to 2007, where he worked tirelessly to forward the strategic direction of the organization. He contributed to WAO's educational programming and enthusiastically promoted the work of the WAO Councils and Committees on which he served. He valued the opportunity to enhance the care of allergic children worldwide through this international role. Cas was a very kind, generous, diplomatic and patient person who worked very hard and did things well. He took a personal interest in his colleagues and especially those who trained in Allergy, and it was typical of him to take the time to visit sick colleagues at their homes. He was a loyal friend and could always be trusted in matters of confidentiality. He took a personal interest in my four children, giving them thoughtful presents on special occasions. My youngest daughter, Hayley, will never forget how he came all the way from his home to the party hall of her 21st birthday, to give her a beautiful silver pendant for her birthday. Dilys Berman told me how she remembered him rushing out to Mowbray to buy a watch for a child in an oncology ward who only had a few days to live but who had always wanted a watch. Cas had many friends all over the world and was a wonderful ambassador for South Africa, always affording visitors the best of South African hospitality. He was elected an Honorary Distinguished Fellow of the American College of Allergy, Asthma and Clinical Immunology. He never rushed into decisions but always allowed time to sort out tricky matters, and he taught us a lot about living harmoniously in a diverse society. He loved taking people out to dinner and making people feel special. My wife and I had dinner with Cas and Farieda at a lovely Indian restaurant in Cape Town three weeks ago and had a wonderful evening, where he enjoyed educating us all about special aspects of Indian cuisine! Although he had diabetes, and had bypass surgery about six years ago, Cas had been feeling well lately and was looking forward to rounding up his career and to doing the things he enjoyed when he retired. Originally a General Practitioner in South Africa, he overcame many obstacles to pursue an academic career, and felt greatly honored and fulfilled to have been awarded Full Professorship by the University of Cape Town this year. A week before he passed away, we discussed his plans for a sabbatical next year and his retirement which would have been at the end of 2011. He regarded his contribution to the recognition of allergology as a sub specialty as the climax of his academic work and contribution to medicine, and he was going to co-direct the new training program for sub-specialists in allergology that we will commence in 2011. Thank you, Cas, for all you taught us. It was a privilege to be your friend and colleague. I will miss you so much. Learn and Publish – Ideal for physicians in training! Dr. Juan Carlos Ivancevich, Editor-in-Chief of the WAO website, and Dr. Constance Katelaris, Web Editor of WAO Allergy Book Reviews, are looking for volunteers to review the latest medical books published on allergy topics. The reviews are posted on the WAO website and included in the monthly electronic newsletter, WAO Reviews. Becoming a book reviewer offers trainees the opportunity to learn while reviewing, and the published reviews count for academic stature and can be included on CVs. To see the reviews already published, visit Allergy Book Reviews on the website. To inquire about the current list of books to be reviewed, contact WAO editorial staff: sdorsano@worldallergy.org. It is now time to nominate for the PhARF Award 2011. The deadline is December 31, 2010. The Award amounts to USD 50,000. To nominate, visit the award site: Nomination to PhARF Award 2011. To apply to become a Member Society of the World Allergy Organization, click here. 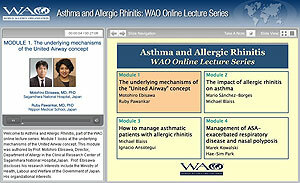 Go to the WAO website (www.worldallergy.org). Click "Members Only" then click on the WAO Journal and login on the WAO Journal site. To enjoy continual access, return to www.WorldAllergy.org and the Members Only section each time to access new full text. Dr. Juan Carlos Ivancevich, Web Editor-in-Chief, has announced new members of the WAO Web Editorial Board. Dr. Rodrigo Rodrigues Alves (Divino Espíritu Santo Hospital in Ponta Delgada, Portugal) has joined the Board as Regional Associate Editor for Europe. Dr. Hector Stone Aguilar (Pediatric Allergy & Immunology in Hermosilla, Sonora, México) is Regional Associate Editor for Latin America. Dr. Alejandra Macías Weinmann (Hospital Universitario Dr. José E. Gonzalez in Monterrey, Nuevo León) is Editor-at-Large, México. WAO Journal Chief Editor Interviews! Co-author: Progress in Understanding Postnatal Immune Dysregulation in Allergic Disease, World Allergy Organization Journal 3(4): 162-166, April 2010. Co-author: Pathological Mechanisms of Skin Homing T Cells in Atopic Dermatitis, World Allergy Organization Journal 3(3): 44-47, March 2010. Go to WAO Journal Chief Editor Interviews to access these and other podcasts. This month's quiz was contributed by Bernard Yu-Hor Thong, MD, of Tan Tock Seng Hospital, Singapore. Quiz: A 32-year-old woman came to the Emergency Department complaining of chronic persistent urticaria and periorbital angioedema, which had been occurring daily for the past four weeks. She was diagnosed with thyrotoxicosis six weeks ago, and she had been started on carbimazole 20 mg bd and propranolol 10 mg tds. Her sister also had a history of urticaria and angioedema. To view additional Upcoming Member Society Meetings, click here. You have received this message because you are a member of a WAO Member Society, you have subscribed for the monthly e-letter or had previous contact with the World Allergy Organization. If you prefer not to receive WAO News & Notes Messages, please reply to this email with REMOVE in the subject line. To be removed from all WAO messages, please reply with REMOVE ALL in the subject line. Made possible through an unrestricted educational grant from Novartis. And with support through an unrestricted education grant from EAMG.